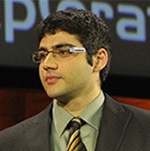 Professor Kapadia joined the faculty of the University of Southern California in the Ming Hsieh Department of Electrical Engineering in July 2014. He received his bachelors in electrical engineering from the University of Texas at Austin in May 2008, and his Ph.D. in electrical engineering from the University of California, Berkeley in May 2013. During his time at Berkeley, he was a National Science Foundation Graduate Research Fellow, and also won the David J. Sakrison Memorial Prize for outstanding research. In 2016, he was awarded an AFOSR Young Investigator Award. His interests lie at the intersection of material science and electrical engineering. Specifically in researching the next-generation electronic and photonic devices as well as the material growth techniques necessary to fabricate these devices. He has authored journal articles relating to electronic devices, photonic devices, nanomaterials growth and applications, and thin-film growth. Notably, he has developed new techniques for growing and integrating compound semiconductors with arbitrary substrates. He has authored over 30 journal articles and holds multiple patents.